To Stuff or to Dress? Do you stuff it or do you dress it? 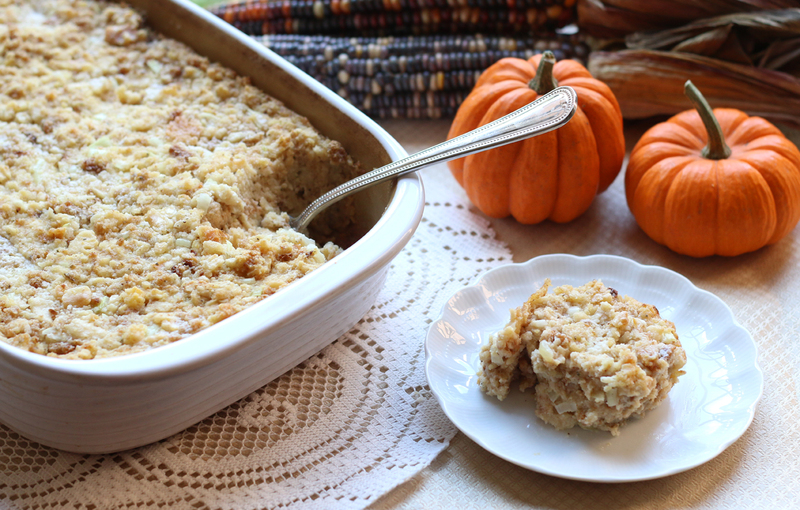 Arguably, besides the turkey, it is one of the most important side dishes for Thanksgiving. So, what is the proper way to refer to it? What is the distinction? Some believe that if it is cooked inside the bird, then it should be called stuffing, and if you prepare it outside the bird, it should be called dressing. However, here in the south, forever in our politeness (stuffing sounds rather unpleasant and possibly vulgar), we call it dressing regardless of its preparation. Likewise, our dear northern friends and family refer to this beloved side dish as stuffing across the board. So who is right? According to the National Turkey Federation, everyone is correct. The National Turkey Federation states that both terms can be and are used “interchangeably.” Regardless if you want to name it stuffing or if you want to name it dressing, we can all agree to call it one thing: yummy! Here are three dressing recipes that I hope you will enjoy this holiday season. I am sharing my Granny Moore’s Dressing, a Pumpkin and Chorizo Dressing and an Individual Bread Dressing with Pears, Bacon and Blue Cheese. You won’t be disappointed with Granny Moore’s Dressing if you desire a timeless southern recipe. The Pumpkin and Chorizo Dressing will be excellent for those that want to be more daring in the kitchen. The Individual Bread Dressing with Pears, Bacon, and Blue Cheese is perfect for parties and entertaining. All of these recipes are unique and flavorful in their own way and either dressing selection will be a delicious addition to your meal. In our family, Thanksgiving isn’t just a delectable feast. It is an opportunity for Granny Moore’s children, the “outlaws” (name given to those married into the family), grandchildren, and great grandchildren to gather together for their traditional family reunion. This is a large group of people. Juanita Moore, also known as Granny Moore, had six children, three girls and three boys, all who have married and expanded the family with children and grandchildren. Thanksgiving creates a wonderful opportunity for this huge Moore Clan to gather for fellowship and superb eating. With the tradition of our family gathering also comes the tradition of making Granny Moore’s Dressing. In 1988, Granny created and hand wrote a small family recipe book she named, “Mother’s Favorite Recipes.” She passed this book down to her children, who then passed down the book to her grandchildren. In this book, you will find the Moore Family favorites such as Sweet Potato Pie, Slaw, Oyster Stew, Martha Washington’s Fruit Cake, and possibly the most treasured recipe, her dressing. Granny Moore was well known for her exceptional southern cooking and her way was the only “correct” way in preparing these favored recipes. Every year, one of Granny Moore’s sons, daughters, or grandchildren will attempt to recreate her dressing. This isn’t an easy task. Granny didn’t use measurements. She tasted and adjusted her dishes until it was how she liked it. In her written version of her recipe, she wrote things like “several cans of milk, broth from the turkey, pats of butter, cooking time not very long,” leaving us to guess the exact measurements, consistency and time. In my research to represent my grandmother-in-law accurately, I called some of her sons and daughters to get the most accurate measurements. Their answers also varied. My other dilemma was that she specified that we must use Ballard Corn Bread Mix. Well, you cannot buy Ballard Cornbread Mix anymore because it is discontinued. Some family members use Jiffy and other family members omit the cornbread all together. Martha White Cornbread claims to use the Ballard Cornbread Recipe. Therefore, I chose to use the Martha White Cornbread for this recipe. And so, while this might not be her “exact” recipe, I hope I have made her proud by replicating it as close to the real thing as possible. Granny Moore is no longer with us today, but we continue her tradition of family gatherings and creating her coveted dressing every Thanksgiving. Traditions are important. They create foundations by allowing us to remember the memories of the past and as we grow creating new memories, we always have something to fall back to. And while we continue to make Granny Moore’s family dressing recipe as a family tradition, we also make it because it is an amazing dressing. It is wonderfully moist and full of that southern soul food flavor. Granny Moore loved her family with all her heart. We still miss her big smile and warm hugs. There wasn’t anything more important to her than family. I hope you enjoy this recipe as much as our family does. Perhaps it may even become part of your family tradition at your Thanksgiving table. This recipe will be soupy when you mix it. Do not panic! This is the desired consistency until it is cooked. The liquid will cook out and after setting; it will firm into a delectable moist pan of dressing. Prepare and cook cornbread mix according to directions. After cornbread is cooked, crumble cornbread into a large mixing bowl. Add in the finely chopped onion, milk, crumbled crackers, Pepperidge Farms Mix, and Broth. Mix well. It should be soupy. Place dressing mix in a large 13×9 in baking dish. Bake uncovered at 350 for about 40 minutes. You do not want it to dry out. Allow it to set for 10 minutes before serving. he South meets southwest with this Pumpkin and Chorizo Dressing. While the combination of the pumpkin, cornbread and cranberries create a sweeter version than your classic dressing, the chorizo and jalapeno offer a nice savory balance. The sweetness compliments the saltiness of the turkey or ham, making it the perfect combination to either holiday dinner. Because the jalapeños are seeded, this dish is not spicy. If you prefer to take it up a notch and create a spicier dish, keep the seeds. Grease a 13×9 baking pan. Take Jiffy Cornbread Mix, egg, and milk and prepare cornbread according to directions on box. Cool cornbread completely. Next cut cornbread into cubes and place in a large mixing bowl. Cook Chorizo. Drain the grease. Add Chorizo to mixing bowl. Add cubed French bread, chopped onion, chopped jalapeno, cranberries, pumpkin, and broth to mixing bowl. Salt and pepper according to taste. Mix well. Add mixture to prepared baking dish. Bake uncovered at 350 degrees for approximately 45 minutes or until lightly browned. his Individual Bread Dressing with Pears, Bacon, and Blue Cheese gives tradition a twist. Dressing, prepared into individual servings, creates a modern presentation to the usual side dish. 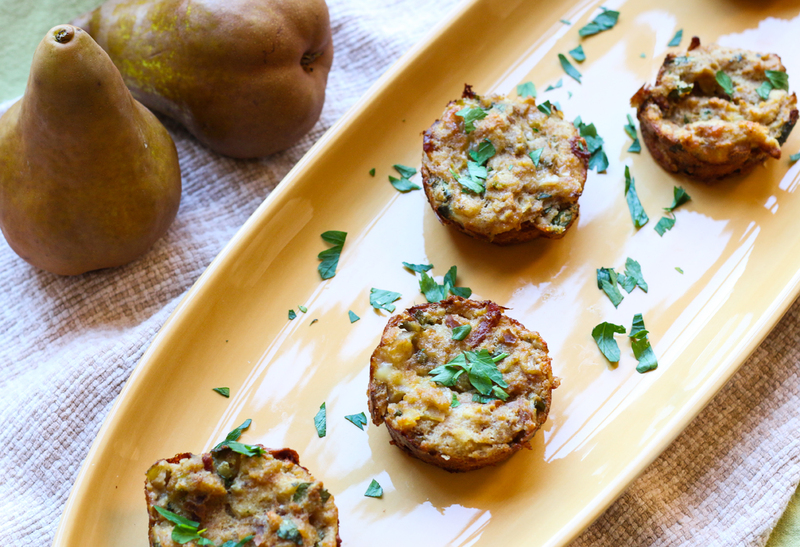 The pears, blue cheese and caramelized onions offer a pleasing gourmet variation. Grease two 12 serving muffin pans. Set aside. Place bread in large mixing bowl. Cook bacon until crispy. Drain bacon reserving 2 tablespoon of the drippings. Crumble bacon and add to bread bowl. Sauté celery and onion in bacon drippings until soft. Add in chopped pears. Sauté mixture until onions begin to caramelize. Add brown sugar. Sauté additional minute for sugar to flavor the mixture. Add sautéed mixture to bread bowl. Add parsley, blue cheese, and sage to bread bowl. Mix well. Beat eggs in separate bowl. Add eggs and broth to bread bowl. Mix well. Evenly distribute dressing mix in the two prepared muffin pans.